Fudge Ripple, IN - - Chris Hodapp, the ninth most popular Masonic author, known primarily for his fifteen year old book "Freemasons for Dummies," is also one of the most prolific Masonic bloggers still active. Brother Hodapp's books, blog articles, and speaking engagements have reached dozens of Freemasons around the globe. As fellow Masons, we are happy for Brother Hodapp's continued success, which is why we reached out to him when we heard about his latest endeavor: Flip This Temple - A television series in which he will feature various lodge buildings around the US, as the lodge members decide to renovate the old buildings, and either keep them or sell them off. TPB: Chris, first we want to thank you for all the work that you do as the unofficial Masonic News Network. 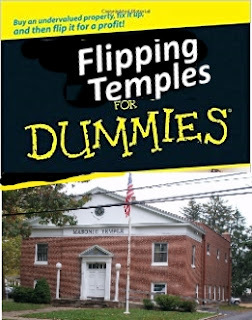 We understand that "Flip This Temple" grew out of some of your reporting. Chris: Yes, I believe that you mentioned that every other blog article seemed to be about some great, historic lodge building that was either being sold off, or was in a terrible state of disrepair. I got the idea while watching TV one night with my wife, and saw that those old "Flip This House" shows have morphed into things like "Flip This Condo", or Trailer or RV, or other things. I made a joke about how it would be nice if we could see such energy with some of the Masons I know remodeling their own lodges. From there, it just sort of... took off. TPB: House flipping shows are really popular for couples to watch, because it gives them ideas for things to do in their own houses. What's the audience draw for remodeling a Masonic lodge? Chris: We think that it's going to appeal to the younger Masons, the 30 to 50 year old crowd who are tired of the old, fake walnut 1970s paneling and the linoleum tiled floors, but who get a lot of pushback from the older past masters who can't imagine spending forty or fifty bucks on some new paint. TPB: So, we understand that the first show will be an old lodge building in Rhode Island or someplace in New England? Chris: That's right. I can't give you any more details, but it's an old building with parts dating back to the late 1700s, that was donated to the lodge in the mid 1800s, and probably hasn't been changed since, except maybe to add electricity and indoor plumbing. TPB: You could be describing half the lodges in New England, right there. Chris: True enough. Anyway, the producers managed to get some free supplies from various advertisers, and the younger lodge members had a couple of months to work on it. Walls were painted, windows were replaced, old carpeting torn out, and fake masonite paneling was burned. After it was finished, the guys then had to decide if the building was still worth keeping, or if they should sell it, take the money, and rent from a lodge with more modern facilities on the other side of town. TPB: Well, so what did they do? Chris: Sorry, can't tell you that. You'll have to wait until it hits the cable channels next season. TPB: Fair enough. Can you tell us about any other upcoming shows? Chris: For the first season, we're just hitting a few smaller lodge buildings in the northeast US, a couple in the mid-west, and we'll end up the season with something out in the northwest US. TPB: Any of those big, multi-lodge buildings in the cities? Chris: While I'd love to tackle some of those old, art deco buildings that take up half a block, the producers have decided to wait a season or two to gauge the interest. Part of it, too, is getting more advertisers and sponsors behind it. Freemasons, as you know, are not noted for spending money on their buildings. Or much else, except their personal jewelry, I might add. TPB: Well, it certainly sounds like a hit, and we wish you the best of luck. Chris: Thanks, guys, I really appreciate that. "Flip This Temple" is in post-production, and we expect to see it on A&E in the next season. I'd rather spend a full year up-cycling all the building materials from our lodge into a single story than hear one more guy complain about the stairs. Apparently complaining is the true fountain of youth. After this flops somebody should do an installment of Paranormal Investigations: Haunted Lodges. I swear I hear things whispered in my lodge that haven't been spoken in public in 50 years. Throw in the cursed stairs that have been blamed for ~40 demits and you've got good TV!